Thank you for joining us for another episode of #ThatBusinessShow with our Host, Jamie Meloni! Today was a great show packed with must have information on insurances, investing, and securing financial security in the future! If you wanted to come on the #MorningAir as well, head to http://www.tampabayradio.com and leave Jamie Meloni a message describing your business or talent and what you do for the Tampa Bay Community! 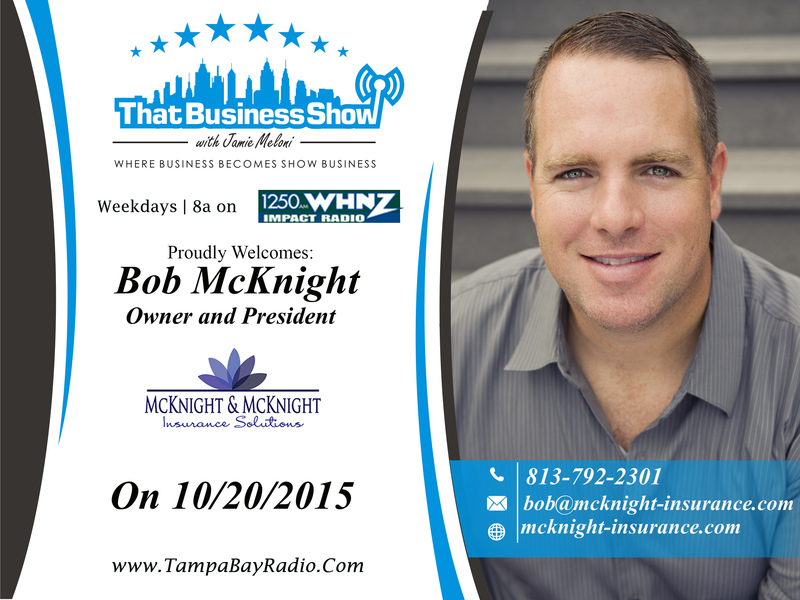 Today on the show, we had Bob McKnight, Founder and CEO of McKnight and McKnight Insurance! 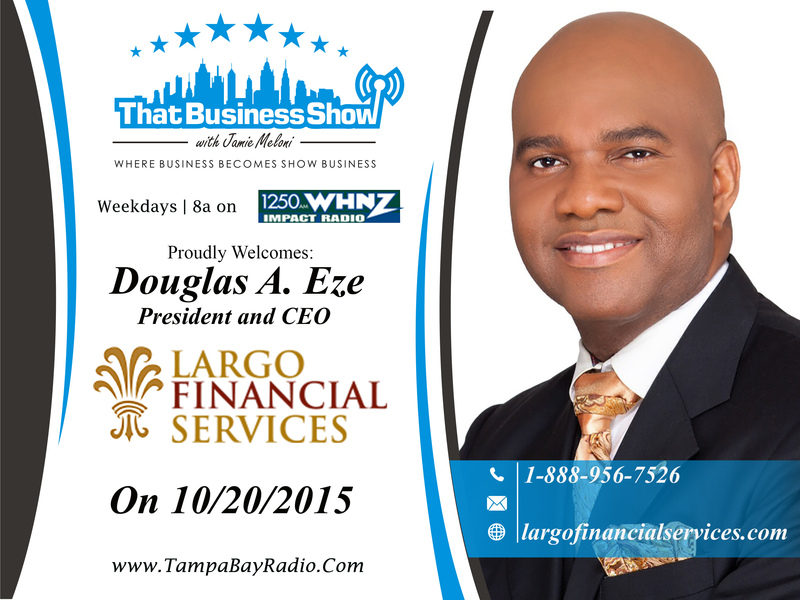 We also had on Douglas Eze, President and CEO of Largo Financial Services. If you missed the #MorningDiscussion, head to http://www.tampabayradio.com to listen to any show on demand, or alternatively head to Jamie’s YouTube Channel at http://www.youtube.com/jamiemeloni to watch the Live Stream! Helping our community figure out what to do when it comes to insurance options and solutions, Bob McKnight, Founder and CEO of McKnight and McKnight Insurance came on the first segment of #ThatBusinessShow! McKnight & McKnight Insurance is a fully independent health insurance brokerage working with all the major carriers ensuring that they always find their clients the best coverage at the lowest cost. Helping over 10,000 individuals, Bob is an expert when it comes to the new healthcare law and can explain what these changes mean to you or your business. He is licensed and certified to assist you both on and off the Health Insurance Marketplace, so no matter what your situation is he can help. Discussing the new Affordable Care Act, Bob spoke to our listeners about the changes when it comes to purchasing, and using care purchased under the new law. He advises everyone to seek out a broker during open enrollment coming November 1st through January 31st, as there are many different plans coming and going in accordance of the new laws! To contact Bob McKnight and checkout McKnight and McKnight Insurance, head to www.mcknight-insurance.com! Many people who have children know that it is important to secure their futures. Douglas Eze, President and CEO of Largo Financial Services knows and understands that especially, and is an expert on strategizing for your future. Douglas A. C. Eze established Largo Financial Services Inc. in 2000 with a vision of providing individuals and small business owners with the education and guidance needed to achieve financial freedom. With over 18 years of experience in the financial services industry, Douglas has continually studied and trained to stay current on the principles and trends of personal finance and wealth accumulation. Douglas spoke to our listeners about the importance of getting professional help when attempting to properly manage your money, as he can negotiate with companies to lower your bills, detect corners that are being cut in insurance, and ensure that your money is being used wisely and not being wasted; so that you can further invest in your future! Douglas wanted everyone to know that life insurance is the key to securing what is known as “Generational Wealth”, which isn’t just being wealthy, but it is the continuation of that wealth throughout your family line. Douglas also has authored a book, “Creating Generational Wealth”, which can be found at http://www.creatinggenerationalwealth.info/! This entry was posted in Articles, Entrepreneurship and Business and tagged business, interview, radio, talk, work. Bookmark the permalink.